Do you really want another sweater? 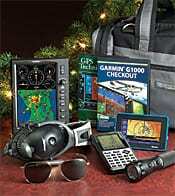 Pilots can take charge of their own Christmas experience by directing friends and family to Sporty’s Gift Guide. Sporty’s has made it easy for non-pilot loved ones to select a gift for the pilot in their life with its list of gifts appropriate for all kinds of pilots. Budgets are taken into consideration as well, as Sporty’s has divided selections by budget. Gift selections start at $30 and increase up to the “over $500” category. Sporty’s Gift Guide can be found here. Merchandise ordered by Wednesday, Dec. 23, can be delivered in time for Christmas, Sporty’s officials add.